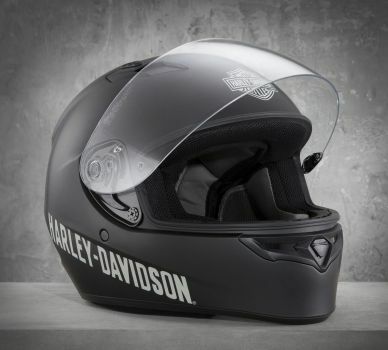 With safety being a priority for all motorcycle riders, it’s important to find the right helmet for you. There are so many different brands and designs of helmets, it is recommended that you try your helmet on before purchasing to ensure it fits correctly, as helmets cannot be returned and you want it to fit correctly to ensure appropriate protection if you are involved in an accident. - Your helmet should be snug on your head, there shouldn’t be any pressure on the front or back of your head. - Your helmet should not be so loose that it moves around on your head, this will cause wind to lift it up while you are riding. - The strap should be done up and sit snugly under your chin. - The helmet should fit as tight as possible without causing discomfort. Over time, the inner lining will compress with use and the helmet will fit slightly larger than when first purchased. - Grab the helmet with both hands and try rolling it forward off your head, with the chin strap done up securely, you shouldn’t be able to roll the helmet forward. - While still holding the helmet with both hands, move your head from front to back and side to side. You should only feel the skin on your head move slightly with the helmet. - Put your eyewear on with the helmet to ensure your glasses, sunglasses or goggles fit well within the helmet and not cause uncomfortable pressure points at your ears or the bridge of your nose. Helmets are non-refundable, so it’s important to ensure that your helmet fits well and will be comfortable for the long haul. Try wearing your Helmet in-store for at least 15-minutes to make sure there is no discomfort. When is it time to buy a new helmet? All helmets have used-by dates and need to be replaced fairly regularly to ensure the standard of safety is maintained. - If you are involved in an accident where you fall off your bike and your helmet makes contact with anything (road, car, etc) you need to replace it. - If your helmet is over 5 years old, you need to replace it. - All Helmets which meet Australian Standards have a reflective sticker. If your Australian standard sticker comes of or rubs off, the word ‘VOID’ will be show where the sticker was, this means it’s time to replace your helmet. - In newer helmets, the Australian Standard stickers are sewn into the inside lining of the helmet and list the manufacture date, these helmets are void 5 years after that date. There are three types of helmets Full-face, Open-Face and Modular or ¾ Helmet. - A Full-Face covers the entire head. It has a rear that covers the base of the skull and a protective section over the front of the chin and a transparent visor across the eyes. - The Open-Face covers the ears, cheeks and back of the head. This style of helmet does not have a protective section over the chin and therefore lacks face protection. - The ¾ Helmet is a hybrid between full-face and open-face helmet, these helmets have a full visor but no protective chin section. You can buy a range of accessories to go with your helmet like transitional visors for use with Full-Face helmets, masks that cover your mouth for use with Open-Face helmets and Bluetooth headsets for listening to music and making/receiving phone calls while you ride. As lots of riders know, riding can be harsh on your hair – especially if you have longer locks. Did you know that if your hair is “whipping in the wind,” then your ends are actually splitting? - If you have one, use a multi-functional headwear and twirl your hair up into it before you put on your helmet. - If you know you’ll be riding all day, use a protein spray, de-tangler or light leave-in conditioner on the ends of your hair to avoid splitting. - When you get home after riding, use a wide-toothed comb to gently comb your hair out, starting at the ends and gently working out any knots. What is the penalty for riding without a helmet? Regulation 244 of the Road Traffic Code 2000 states that a motorcycle must not be ridden unless an approved standard or type of helmet is securely fitted and fastened to the head of the rider. Failure to comply can incur 4 demerit points and a $550 fine. Regulation 244 also stipulates that any other person, who is riding or being carried on the motorcycle, including a moped, shall wear an approved protective helmet fitted securely on the head. The fine is $550 for failing to comply for the passenger, and possibly also for the driver. Contact the Merchandise Department on 08 9458 6754 or visit the Dealership.